Over the last 3 days the Lower Thames watershed has received around 15 mm of rainfall with temperatures well above freezing. 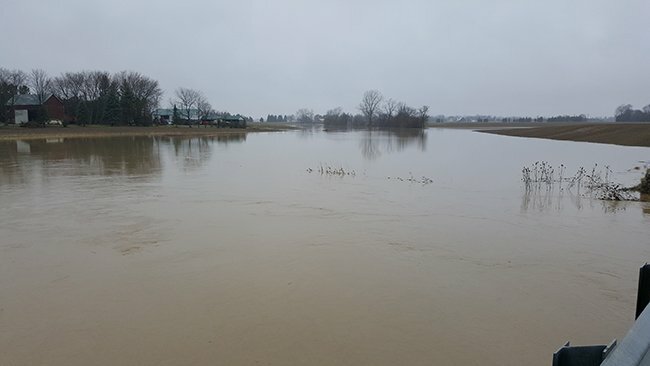 The Upper Thames watershed has also experienced warm and wet conditions. Temperatures have now fallen below freezing and are expected to remain there over the next week. Before this warm up, the Thames River at Lighthouse Cove has approximately 30 cm of ice cover and many of the region’s smaller watercourses were filled with snow and ice. The warm temperatures and rain have melted most of the snow from the lower watershed. Water levels have risen on many of the region’s smaller local watercourses and some have spilled their banks. In some areas the situation has been aggravated by snow and ice blockages in those watercourses. The Indian-McGregor Creek Diversion Channel began operating last evening to protect the south end of the City of Chatham from flooding. Over the next few days, water levels will rise on the Thames River. Elevated water levels can be expected into early next week as the water from the Upper Thames makes its way downstream. Water levels will rise enough to flood the low-lying river flats adjacent to the Thames River from Delaware to Chatham. Associated with this, the river ice is expected to lift and break up. Some minor jamming of river ice can be expected over the next few days. However, this combination of ice thickness, anticipated flows and temperatures has not caused any significant ice jam related flooding in the past. This message will be in effect until January 17th, 2018.